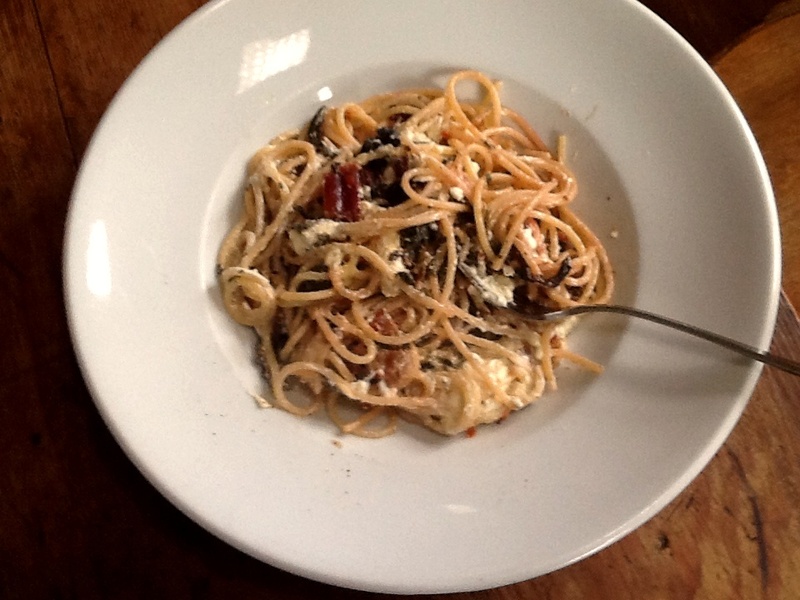 Ricotta and Beetroot Tops Pasta. One of the best pastas I have ever eaten and I have eaten a LOT of pasta! Put the spaghetti into fast boiling, salted water. Cook until al dente, not soggy. Use a pan big enough to hold the sauce and the pasta. Crisp the bacon in olive oil and add the chili and garlic. When the garlic has softened add the beetroot tops and fry for a bit. Cook until the beetroot is hot, check for salt and pepper. Stir in the ricotta, not too well, keep a few lumps in the mix Add the pasta and mix. Serve with grated parmgiano . Have you tried baking it yet? I love beetroot tops. I had never tried them before I grew beetroot for the first time last year and they are absolutely delicious. I actually liked the tops better than the root! What about dehydrating them till crisp and dry and turning them into a powder to use in soups etc. ? Even though I have a dehydrator, which I use a lot, the costs involved in drying a product like beetroot tops are prohibitive. It also changes the inherent characteristics of the product too much. I find the best way to preserve most products is by vacuum sealing – I have a huge industrial vacuum sealer – then pasteurising the bag in boiling water. In this way the product retain more of its original flavor, coloring and nutrients and will last for almost ever. It is also easy and cheap to store thereafter as you do not need a refrigerator or anything – just store in in the pantry. Try it – it is worth it!! !